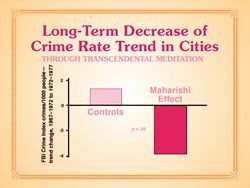 When one per cent of the population of a city or town practices Maharishi’s Transcendental Meditation Programme, the crime rate significantly decreases over the long term. This is known as the Maharishi Effect, which is the phenomenon of the rise of coherence in the collective consciousness of any community. 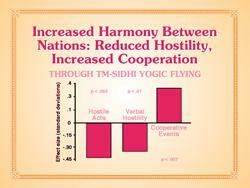 The collective practice of Maharishi’s Transcendental Meditation and Transcendental Meditation Sidhi Programme creates harmony and coherence throughout the environment, leading to reduced hostility and increased cooperation between nations. 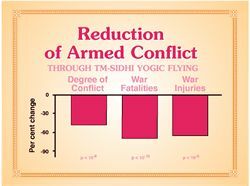 Large groups of individuals practising Maharishi’s Transcendental Meditation and Transcendental Meditation Sidhi Programme create an environment of harmony and coherence for themselves and for the whole world. 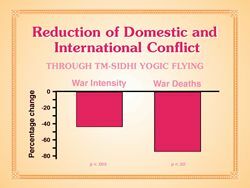 When the number of individuals practising Maharishi’s Transcendental Meditation and Transcendental Meditation Sidhi Programme in a group excedes the square root of one per cent of a nation’s population,there is a significant reduction in conflict both at home and throughout the world.